SOAPware's previous Patient Portal version 1 has been disabled. 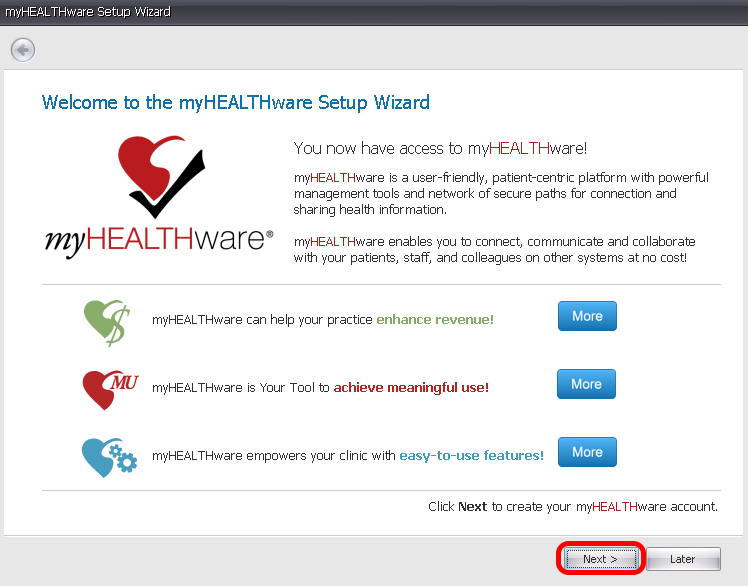 All patients who wish to view their medical summary online will need to create a new myHEALTHware account. *Note: The first employee with administrator privileges to log into SOAPware is the only one who will follow the steps in the Setup Wizard. This person will also be the administrator of the myHEALTHware organization. If you are designated a Clinical Administrator in SOAPware, the myHEALTHware Setup Wizard will pop up if the clinic organization has not been created. Click Next to proceed with the setup process.